A flashing is an essential element allowing correct installation of OptiLight roof window in the roof slope. 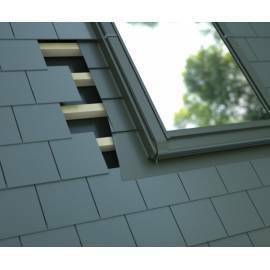 The precisely designed systemic elements of the flashing enable tight and durable integration of the OptiLight window with roofing materials. It is very important as the main task of the flashing is to drain water and snow away from the Optilight window and protect it against the wind. 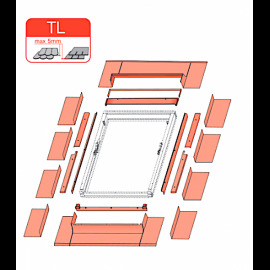 The flashings are manufacture from aluminium sheet, coated with hard-wearing polyester lacquer. 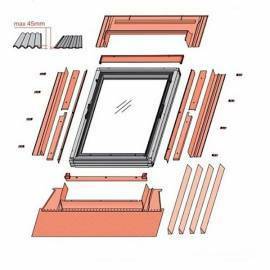 OptiLight flashing kit contains some external elements of the window which are must to fit the window. If you don't have a flashing kit from previous project you must buy flashing kit. The basic colour is grey - brown (RAL 7022), thanks to which windows go well with standard colours of roofing materials.